Cancer is usually thought to be a disease that affects individuals. But could cancer evolve to become infectious? This case follows the research on a form of transmissible cancer that is decimating the Tasmanian devil, the world’s largest carnivorous marsupial. 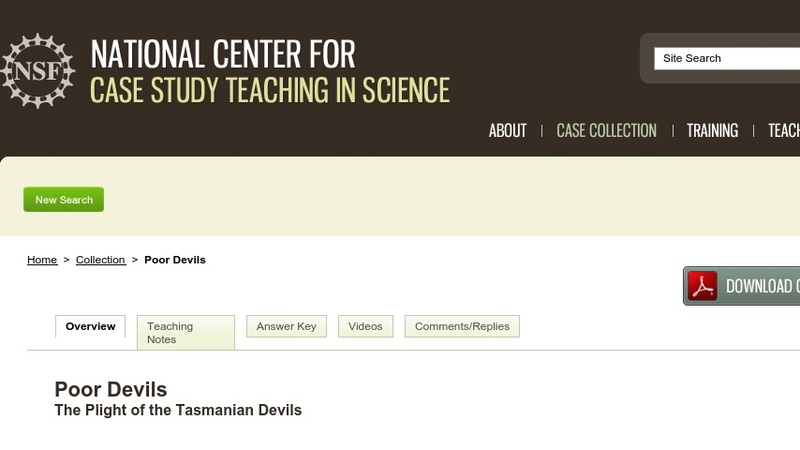 Students analyze two landmark papers that uncovered the molecular mechanism of this cancer, which is known as Tasmanian Devil Facial Tumor Disease (DFTD). Through this case, students develop an understanding of cancer, immunology, microbiology, and cytogenetics in addition to becoming more comfortable using primary research literature. The case was developed for third-year biology students in a molecular biology course, but may also be used in courses in genetics, evolution, immunology, conservation, and research methods.